Hanrahan field, now known as Courtbrack, is located on the Dock Road in Limerick city. Michael Alfred Hanrahan, who lived at 8 Lower Mallow Street in Limerick city, was a coal merchant and lime burner who conducted his business out of the field from at least 1875. Some may say Hanrahan field is cursed, certainly the friends and family of those poor souls who met their tragic end there. Below documents the history of some people, who came from different places and different times, who lost their lives at Hanrahan field. The below map is from the 1907 Sale of Limerick. Perhaps the bad luck that engulfed Hanrahan’s Field began with Michael Alfred Hanrahan himself. Michael and his wife Mary Anne O’Brien’s family was filled with tragedy, with only one or perhaps two of their eight children surviving them. The first of their children to pass was their infant son John on February 3rd 1881. Only a few months later their daughter Ethel Josephine (Josephine Ethel) born 1882, died in infancy. This was followed less than two years later with the death of another son Alfred Timothy, aged 5 months in February 1884. The following year on January 7th 1885, the family began to lose their older children, beginning with their eldest daughter Mary Letetia (Margaret, born 1875) aged 10y 11m. She died at their home on Mallow Street. She was followed three years later in 1888 by her brother, 9 year old son Byran Jerome. Finally the curse seemed to be broken with Mary Ursula, known as May, their second daughter who died in October 8th 1890 at her aunts house in London. 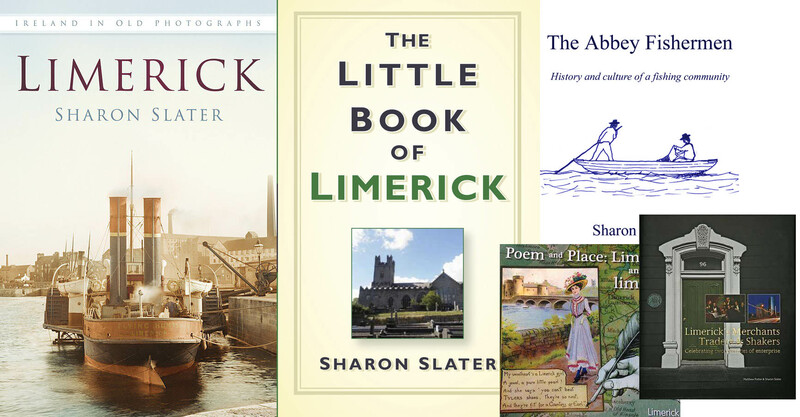 Then, on 1st of April 1897, on some random Wednesday, Michael O’Brien, 33, had an argument with his mother with whom he lived at 10 Frederick Street in Limerick city. After the argument he left the house and did not return. The next few nights he spent sleeping rough and the following Saturday he went into Hanrahan’s field on the Dock Road, where there were two lime kilns in the field, one of which was disused and the other still in use. It was raining very heavy that night so Michael took shelter in the warmth of the lime kiln that was operational. Lime Kilns, which were once a common feature in the Irish landscape, were structures in which limestone was heated to a high temperature to produce quicklime. As a result, they maintained a temperature that seemed appealing to wandering travelers on cold Irish nights. Carbolic acid gas was produced during the making of the lime and during the night this engulfed the man, Michael, in the kiln. This acid was poisonous and caused him to become drowsy. Following this he left the kiln to get some air but burnt himself in the process. Then he lay on the ground close to the kiln and fell asleep. The carbolic acid took full effect while he was sleeping, causing him to go into a coma. He was found dead the next morning and was buried on the 5th of April 1897 in Mount Saint Lawrence Cemetery. In November that year four men were caught and fined for sleeping in the same kiln in Hanrahan’s field. Hanrahan’s field would be the scene of another tragedy a few years later when William Joseph Tuohy and his brother John went for a swim. Eleven year old William and twelve year old John lived only a short distance away in Mount Kenneth with their widowed mother Mary who ran a boarding house. The 21st of July 1900 was a warm summers day and the two brothers as well as a small gang of boys went to the quarry at Mr. Hanrahan’s field off the Dock Road, at about 7:30pm for a swim. The depth of the water in this quarry ranged from one to seven feet. William had only learned to swim three days prior, though would have enjoyed splashing around with his friends. After a few minutes in the water William called to his brother: “Oh, save me Jack!”. His friend Jim Barry, who was also eleven, jumped into the water. William, who was panicking, grabbed him around the neck and they both sunk under the water. They separated when they reached the top of the water and William sank again. Jim tried a second time to rescue him but sadly this attempt failed, and William drowned that sad, fateful day. In 1901, Michael Hanrahan and his wife Mary Anne were living with their two surviving children, James Arthur born in 1886, and Monica Magdalen born in 1878. By 1911, Mary Anne had passed away, James cannot be located and Monica remained single and living with her father. Michael passed away at his home on Mallow Street in January 1913 aged 68. All the family are buried in in Mount Saint Lawrence Cemetery. 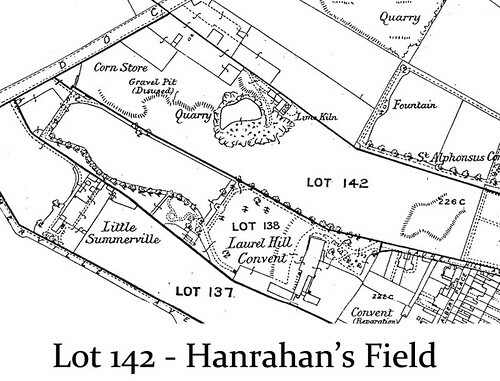 Hanrahan’s Field continued to be used as a quarry as well as a place for local children to play well into the 20th century.